Bees and flowers will always be perfectly matched. Give her flowers like her and let her know your love! https://farm5.staticflickr.com/4812/46868166221_56fe0904d7_b.jpg Bees and flowers will always be perfectly matched. Give her flowers like her and let her know your love! *Gift box size: 17 x 17 x 6.5cm The gift box set includes (pictured): - 1. 1 bunch of natural mini dry bouquet (about 8cm long, full bouquet) 2. 1 small bee necklace *Little Bee Necklace Material: Rhodium-plated copper (Rhodium, an anti-oxidation metal, not easily discolored.) Bee honey is a Czech spar Color: gold Dimensions: 1.5cm (w) X 1.7cm (h) * Calculated in the widest / highest (whispering: Most of the honey collected is a little bit sweeter~) necklace Material: Rhodium-plated copper chain (Rhodium, an anti-oxidation metal, not easily discolored.) Color: gold Size: 45cm (full length) **Korean material** *bouquet: Natural dry flowers are seasonal items, and the bouquet may not be exactly the same as the photo, but the store will choose a beautiful and well-matched beauty bouquet to make the recipients happy. 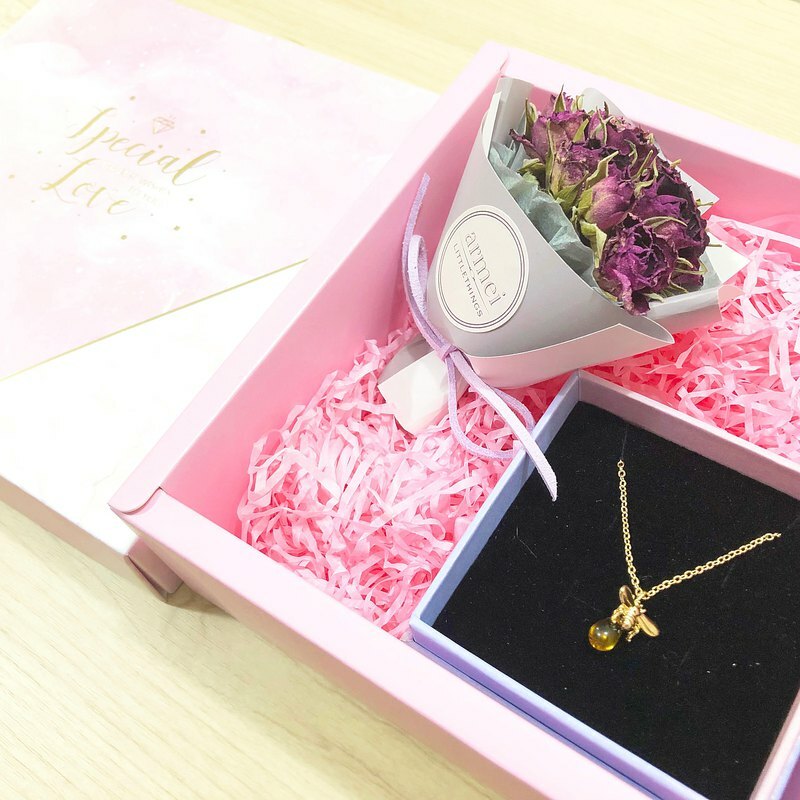 Gift boxes can choose other accessories in the store, the price will be slightly different, if you need, please contact us. 【Precautions】 - All works are packaged for service. Please read the trading policy for detailed terms. - Take pictures in kind, or may cause slight chromatic aberration due to factors such as light or computer screen resolution. The actual work is subject to change. Please understand. - All hand-made, the size of the work may have a size error of about 0.1-0.4cm, please understand. - Do not wash. It is recommended to wipe with a slightly damp cotton cloth. - Please remove when bathing and swimming. - When not wearing, it is recommended to store in a dry place. - Each piece is carefully crafted and will not accept cancellations/refunds/returns. If you have any questions, please contact me first to find a solution.